The margin, border, and padding can be broken down into top, right, bottom, and left segments (e.g., in the diagram, "LM" for left margin, "RP" for right padding, "TB" for top border, etc.). The content edge surrounds the rectangle given by the width and height of the box, which often depend on the element's rendered content. The four content edges define the box's content box. The padding edge surrounds the box padding. If the padding has 0 width, the padding edge is the same as the content edge. The four padding edges define the box's padding box. The border edge surrounds the box's border. If the border has 0 width, the border edge is the same as the padding edge. The four border edges define the box's border box. The margin edge surrounds the box margin. If the margin has 0 width, the margin edge is the same as the border edge. The four margin edges define the box's margin box. Each edge may be broken down into a top, right, bottom, and left edge. The dimensions of the content area of a box — the content width and content height — depend on several factors: whether the element generating the box has the 'width' or 'height' property set, whether the box contains text or other boxes, whether the box is a table, etc. Box widths and heights are discussed in the chapter on visual formatting model details. The background style of the content, padding, and border areas of a box is specified by the 'background' property of the generating element. Margin backgrounds are always transparent. a bit longer to illustrate wrapping. results in a document tree with (among other relationships) a UL element that has two LI children. 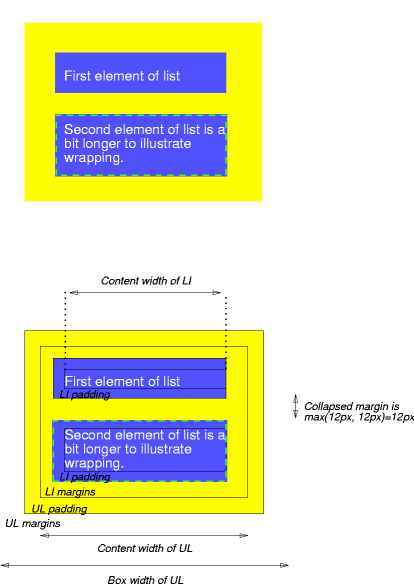 The content width for each LI box is calculated top-down; the containing block for each LI box is established by the UL element. The margin box height of each LI box depends on its content height, plus top and bottom padding, borders, and margins. Note that vertical margins between the LI boxes collapse. The right padding of the LI boxes has been set to zero width (the 'padding' property). The effect is apparent in the second illustration. The margins of the LI boxes are transparent — margins are always transparent — so the background color (yellow) of the UL padding and content areas shines through them. The second LI element specifies a dashed border (the 'border-style' property). Margin properties specify the width of the margin area of a box. The 'margin' shorthand property sets the margin for all four sides while the other margin properties only set their respective side. These properties apply to all elements, but vertical margins will not have any effect on non-replaced inline elements. See the section on calculating widths and margins for behavior. Negative values for margin properties are allowed, but there may be implementation-specific limits. These properties have no effect on non-replaced inline elements. These properties set the top, right, bottom, and left margin of a box. The 'margin' property is a shorthand property for setting 'margin-top', 'margin-right', 'margin-bottom', and 'margin-left' at the same place in the style sheet. If there is only one component value, it applies to all sides. If there are two values, the top and bottom margins are set to the first value and the right and left margins are set to the second. If there are three values, the top is set to the first value, the left and right are set to the second, and the bottom is set to the third. If there are four values, they apply to the top, right, bottom, and left, respectively. Margins of the root element's box do not collapse. If the top and bottom margins of an element with clearance are adjoining, its margins collapse with the adjoining margins of following siblings but that resulting margin does not collapse with the bottom margin of the parent block. A collapsed margin is considered adjoining to another margin if any of its component margins is adjoining to that margin. Note. Adjoining margins can be generated by elements that are not related as siblings or ancestors. The bottom margin of an in-flow block box with a 'height' of 'auto' and a 'min-height' of zero collapses with its last in-flow block-level child's bottom margin if the box has no bottom padding and no bottom border and the child's bottom margin does not collapse with a top margin that has clearance. A box's own margins collapse if the 'min-height' property is zero, and it has neither top or bottom borders nor top or bottom padding, and it has a 'height' of either 0 or 'auto', and it does not contain a line box, and all of its in-flow children's margins (if any) collapse. When two or more margins collapse, the resulting margin width is the maximum of the collapsing margins' widths. In the case of negative margins, the maximum of the absolute values of the negative adjoining margins is deducted from the maximum of the positive adjoining margins. If there are no positive margins, the maximum of the absolute values of the adjoining margins is deducted from zero. If the top and bottom margins of a box are adjoining, then it is possible for margins to collapse through it. In this case, the position of the element depends on its relationship with the other elements whose margins are being collapsed. If the element's margins are collapsed with its parent's top margin, the top border edge of the box is defined to be the same as the parent's. Otherwise, either the element's parent is not taking part in the margin collapsing, or only the parent's bottom margin is involved. The position of the element's top border edge is the same as it would have been if the element had a non-zero bottom border. Note that the positions of elements that have been collapsed through have no effect on the positions of the other elements with whose margins they are being collapsed; the top border edge position is only required for laying out descendants of these elements. The padding properties specify the width of the padding area of a box. The 'padding' shorthand property sets the padding for all four sides while the other padding properties only set their respective side. Unlike margin properties, values for padding values cannot be negative. Like margin properties, percentage values for padding properties refer to the width of the generated box's containing block. These properties set the top, right, bottom, and left padding of a box. The 'padding' property is a shorthand property for setting 'padding-top', 'padding-right', 'padding-bottom', and 'padding-left' at the same place in the style sheet. If there is only one component value, it applies to all sides. If there are two values, the top and bottom paddings are set to the first value and the right and left paddings are set to the second. If there are three values, the top is set to the first value, the left and right are set to the second, and the bottom is set to the third. If there are four values, they apply to the top, right, bottom, and left, respectively. The example above specifies a '1em' vertical padding ('padding-top' and 'padding-bottom') and a '2em' horizontal padding ('padding-right' and 'padding-left'). The 'em' unit is relative to the element's font size: '1em' is equal to the size of the font in use. The border properties specify the width, color, and style of the border area of a box. These properties apply to all elements. Note. Notably for HTML, user agents may render borders for certain user interface elements (e.g., buttons, menus, etc.) differently than for "ordinary" elements. The border's thickness has an explicit value. Explicit border widths cannot be negative. These properties set the width of the top, right, bottom, and left border of a box. This property is a shorthand property for setting 'border-top-width', 'border-right-width', 'border-bottom-width', and 'border-left-width' at the same place in the style sheet. If there is only one component value, it applies to all sides. If there are two values, the top and bottom borders are set to the first value and the right and left are set to the second. If there are three values, the top is set to the first value, the left and right are set to the second, and the bottom is set to the third. If there are four values, they apply to the top, right, bottom, and left, respectively. The border color properties specify the color of a box's border. The border is transparent (though it may have width). The 'border-color' property can have from one to four component values, and the values are set on the different sides as for 'border-width'. In this example, the border will be a solid black line. No border; the computed border width is zero. Same as 'none', except in terms of border conflict resolution for table elements. The border makes the box look as though it were embedded in the canvas. The opposite of 'inset': the border makes the box look as though it were coming out of the canvas. All borders are drawn on top of the box's background. The color of borders drawn for values of 'groove', 'ridge', 'inset', and 'outset' depends on the element's border color properties, but UAs may choose their own algorithm to calculate the actual colors used. For instance, if the 'border-color' has the value 'silver', then a UA could use a gradient of colors from white to dark gray to indicate a sloping border. The 'border-style' property sets the style of the four borders. It can have from one to four component values, and the values are set on the different sides as for 'border-width' above. In the above example, the horizontal borders will be 'solid' and the vertical borders will be 'dotted'. Since the initial value of the border styles is 'none', no borders will be visible unless the border style is set. This is a shorthand property for setting the width, style, and color of the top, right, bottom, and left border of a box. The 'border' property is a shorthand property for setting the same width, color, and style for all four borders of a box. Unlike the shorthand 'margin' and 'padding' properties, the 'border' property cannot set different values on the four borders. To do so, one or more of the other border properties must be used. Since, to some extent, the properties have overlapping functionality, the order in which the rules are specified is important. In the above example, the color of the left border is black, while the other borders are red. This is due to 'border-left' setting the width, style, and color. Since the color value is not given by the 'border-left' property, it will be taken from the 'color' property. The fact that the 'color' property is set after the 'border-left' property is not relevant. For each line box, UAs must take the inline boxes generated for each element and render the margins, borders and padding in visual order (not logical order). When the element's 'direction' property is 'ltr', the left-most generated box of the first line box in which the element appears has the left margin, left border and left padding, and the right-most generated box of the last line box in which the element appears has the right padding, right border and right margin. When the element's 'direction' property is 'rtl', the right-most generated box of the first line box in which the element appears has the right padding, right border and right margin, and the left-most generated box of the last line box in which the element appears has the left margin, left border and left padding.